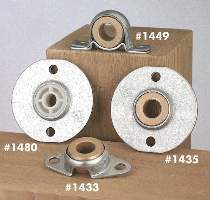 Side flange, center flange and pillow block bearings. Oil impregnated, sintered bronze bearings have 1/2" inside dia. hole. The center flange bearing is also available with a nylon bearing #(1480) with 3/8" inside dia. hole. Sold in pairs.